The Piazza del Duomo (‘Cathedral Square’), founded in the 12th century, took on the appellative Grande around the second half of the 17th century. It has always been not only the place from which the political power of the citizens’ representatives has been exercised, but also the seat of religious power. From the Porta Regia of the Cathedral and the 16th-century pulpit (1500-1501), from the railings around the Palazzo of the Commune, or before that, from the Preda Ringadora (the ‘Haranguing Stone’), the rules of religious and civic life have over long years been formulated. Beautifully framed by the Ghirlandina Civic Tower, by the lofty arcade of the Palazzo of the Commune, the town’s administrative headquarters, in the past also the criminal court, and by the Cathedral, the Piazza Grande is a space which the citizens often felt to be very much their own, so much so that local statutes often forbade people from eating or drinking there. The Piazza was first and foremost home to the market. The local community established the time and place of trade and the layout of stalls in the Piazza, portable makeshift structures which on Saturdays or other market days had to be lined up in long parallel rows. 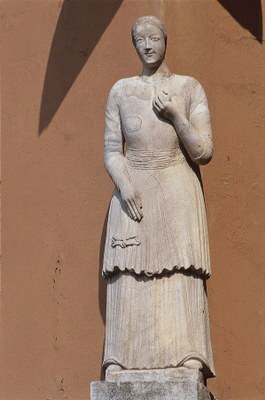 This economic aspect is reflected to this day in the presence of the Bonissima, who is today positioned on the corner of the Palazzo of the Commune. 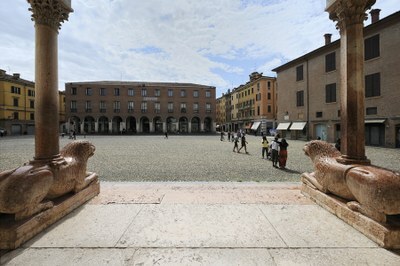 The Piazza, the market and the shops under the arcade of the Palazzo Comunale were much more than mere trading places. They were meeting points, stages for chatter on local topics, exchanges of opinion on political, religious and social events. In the Square also, justice was administered, mainly on Saturday, the market day. The terrible spectacle of the justice system manifested itself in the Piazza with the use of the gallows, the chopping block, instruments of torture, and the Preda Ringadora, on which unidentified corpses were laid so that they might be recognised, whether they had been found under the arcades, fished out of ditches, or simply hanged until dead from the noose outside the Palazzo. The Piazza was therefore the place in which the authorities communicated, and were celebrated and represented; also through the terrible face of the rituals of justice. In addition, this space was also home to solemn religious processions, which departed from here then went along the main city streets. With the widespread participation of the local population, the City Council itself organised penitential processions, sacred performances and numerous celebrations in honour of the city’s patron, Saint Geminianus. On these occasions, the sacred and the profane often switched roles, and at times even overlapped. Masked celebrations and horse fairs brought the Piazza to life around carnival time or during other fairs and celebrations. The start of the period of merrymaking was signalled to the local population by a huge mask (known as the ‘mascherone’) which would be lowered from the top of the Palazzo Comunale. In these periods tournaments, displays of the carriages of ladies and gentlemen, and allegorical carnival floats, were all organised; alongside stalls selling goods of all kinds, stages were erected for acrobats to perform and for mountebanks to try and sell a variety of miraculous remedies. Lastly, the Piazza was enflamed by great celebratory fires to celebrate joyful events involving the whole town, such as the birth of princes or the election to the cardinalate of an illustrious citizen. On the issue of the ownership and use of the Piazza the religious and political powers often clashed, as shown by the vicissitudes linked to the expenses incurred for the restoration of the Ghirlandina Civic Tower over the 16th and 17th centuries, by the numerous conflicts over the holiness of places of worship, and by the material nature of the local economy, whose shops and stalls almost overflowed inside the Cathedral. With the construction of the Ducal Palace, the Piazza Grande partly lost its role as the main stage for celebrations and performances commemorating ducal power, while the local population continued to meet here, for example to play “biribisso” (lotto) or to race horses. And throughout the 18th century, the Piazza continued to feature the ferocious rituals of capital executions. Following the passage to the Napoleonic era, with the abandonment of the city by Hercules III, the Piazza returned once more to serve as a point of reference for all citizens. For the city, the start of the 20th century was marked by restoration work on the Cathedral, which was then isolated both from the Palazzo of the Archbishopric and from the canonicals: these were the first signs of renewal in the ancient Piazza. The gradual economic wellbeing which began in the 1950s was marked perhaps most clearly by the new use made of the Piazza: as a car park. Later on, the talk of the chronicles, both local and national, was the destruction of the Palazzo di Giustizia (‘Palace of Justice’), which was knocked down in 1963 to make way for the new headquarters of the Cassa di Risparmio bank, designed by the architect Giò Ponti. In the second half of the 20th century, culture achieved a dominant role in Piazza Grande. Examples of this are; the contemporary art installations of the 1970s; the exhibitions on the ground floor of the Palazzo Comunale; the first editions of “Teatro in Piazza; the photo projections of Giuseppe Panini and Beppe Zagaglia; the cross-cultural events of the 1990s; the first editions of the Modena International Military Tattoo; the Serate Estensi (‘Este Evenings’); the singing performances of the Corale Rossini in the 1950s, and the concerts which began to take place here in the 1970s. 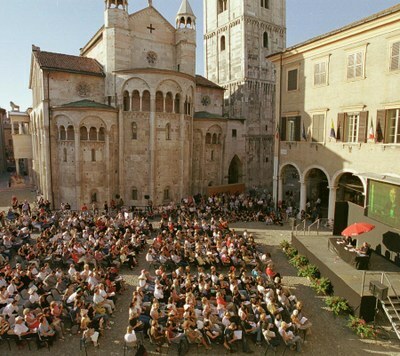 Since 2001 the cultural image of Piazza Grande has been largely maintained by the Festivalfilosofia: every year the Square is host to lectures given by prominent philosophers, with debates, readings and new gazes on contemporary man and his world, as is clearly shown through the overarching themes of the various editions.